Review by AllTheBestFights.com: 2016-09-16, fight not particularly good between Ishe Smith and Frank Galarza: it gets two stars. The former Ibf light-Mw champion Ishe Smith entered this fight with a boxing record of 28-8-0 (12 knockouts) and he is ranked as the No.13 super welterweight in the world. He fought three times last year beating Cecil McCalla (=Smith vs McCalla) and Tommy Rainone, but between these two fights he lost to Vanes Martirosyan (via majority decision, Martirosyan vs Smith). His opponent, Frank Galarza, has an official record of 17-1-2 (11 knockouts) but he comes off the loss against Jarrett Hurd (=Galarza vs Hurd). 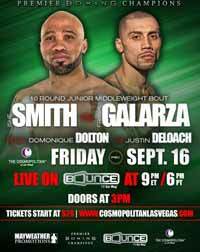 Smith vs Galarza is the main event of the evening. Watch the video and rate this fight!